Today we are excited to introduce our April Leading Lady, Rubeena Naz. Ruby caught our attention by participating in our challenges and sharing her projects on our join in to win page and in social media with her stylish and sensational projects. Ruby is one of those incredibly kind, supportive and talented crafters that make our community such a joy to be in. Over the next few Saturdays in Ruby will be leading us on a journey of her own design and imagining. Make sure to visit her blog, A Rare Ruby, to see more from her and for a chance to win a giveaway! Please give Rubeena a big round of applause to welcome her as she steps onto the stage for her first performance as our April Leading Lady! Good morning! I am so excited to share that this month, I will be a guest designer for Winnie & Walter as their April Leading Lady! I received the invite from the awesome Shay a few months back and, of course, I had to say yes! What a wonderful opportunity to be featured on their blog, among their talent, and to be able to show off how I use Winnie & Walter products! Shay is the sweetest! Thank you so much for asking me. I am truly humbled. Because she's the sweetest, Shay is offering my blog followers a $30 Winnie & Walter gift card as a giveaway. You can see the details of the giveaway at the end of this post. Every Saturday this month, I will be showing off some projects using Winnie & Walter products. Today's focus will be on color palettes and how specific color schemes can inspire your projects. I'll share projects using one of my favorite combinations: black, white, and gold with a touch of color. For the first card, I wanted to create my own background using In Bloom: Addie's Garden. I wanted the focus to be on white and black and then add a little bit of color and gold. 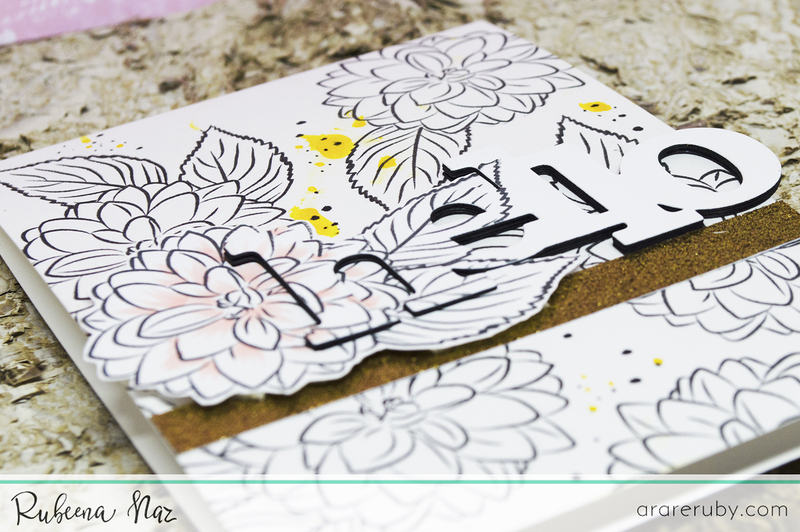 To begin, I took one of the large floral images and stamped all over my card base with a Copic-friendly black dye ink. Next, I stamped the image on masking paper so I could mask the flower in order to stamp leaves behind it. I stamped a flower and two leaves on separate white card stock, which I would fussy-cut. However, before I cut it, I die-cut the word 'hello' using In a Word: Hello Cutaway partially through the flower. I die-cut the word 'hello' four more times from black card stock so I could stack them together for dimension (remember how I love that?). 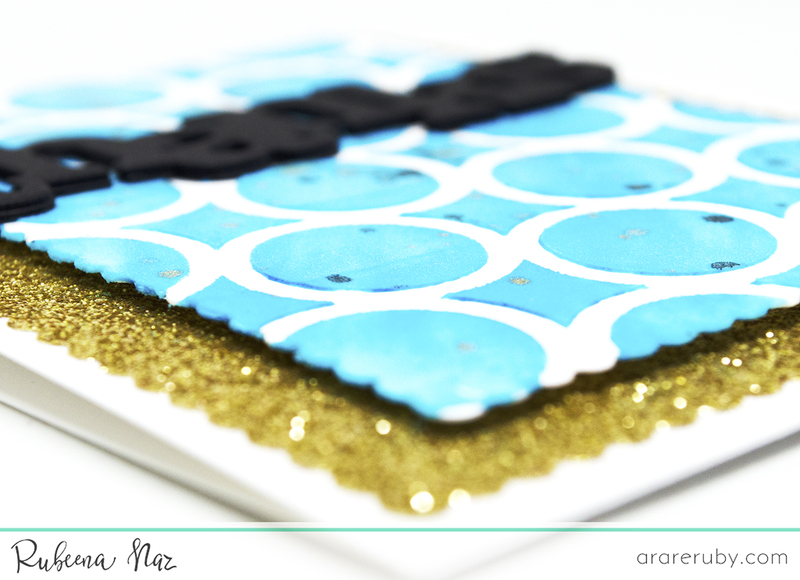 I added a strip of gold glitter card stock so I could add my touch of gold on this card. Using a light pink Copic marker, I added my touch of color on the floral image. I fussy-cut around it and added some foam tape behind it carefully. I arranged the 'hello' with the floral image and matted it down over my black and white background. I got a little excited and started adding white and gold splatters and dots. Some of them were accidental, but I think it adds a lovely touch. 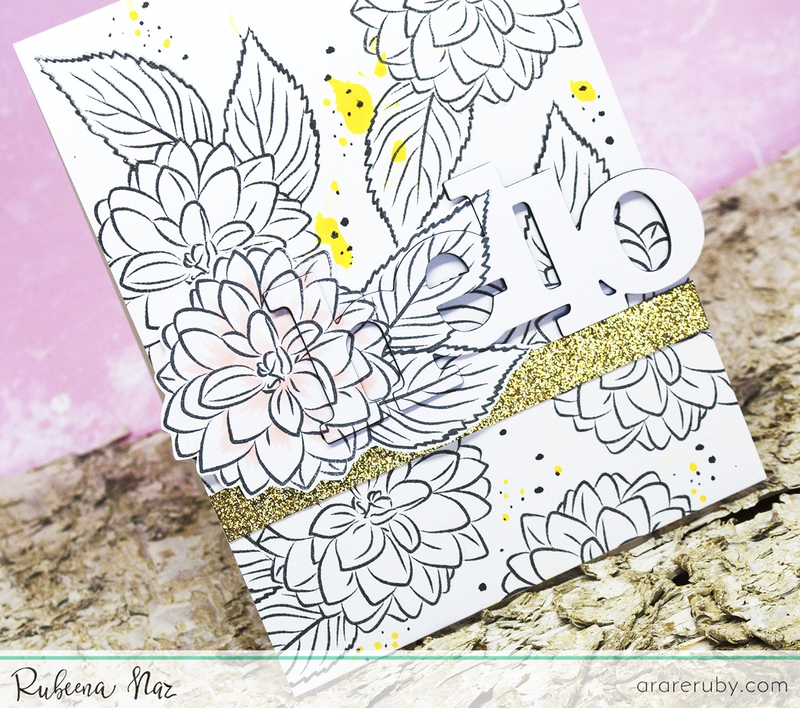 For the next card, I went a little more bold and did absolutely no stamping! One way to add color is using stencil. There are a few ways to use stencils, but I used embossing paste here. I just want to add that the scallop frames from the Essentials: Audrey Cutaways are my favorite dies recently! To begin, I die-cut gold glitter card stock using the larger scallop frame and die-cut heavy white card stock using the smaller frame. I knew I wanted to add my color using the Scenery: Pattern of the Rings Creative Screenings stencil. I arranged the stencil diagonally over the smaller scallop frame and taped it down on all sides with blue painter's tape. I used white embossing paste mixed in with drops of Mermaid Lagoon Distress Ink reinker. I added the paste over the stencil and added splatters of white and gold watercolors over it. I carefully removed the stencil and cleaned up my mess before it dried. I die-cut the word 'thanks' from In a Word: Thanks Cutaway from black card stock four times and stacked them for dimension using glue. Once the embossing paste was dry, I arranged the small scallop frame over the large gold glitter frame with foam tape. 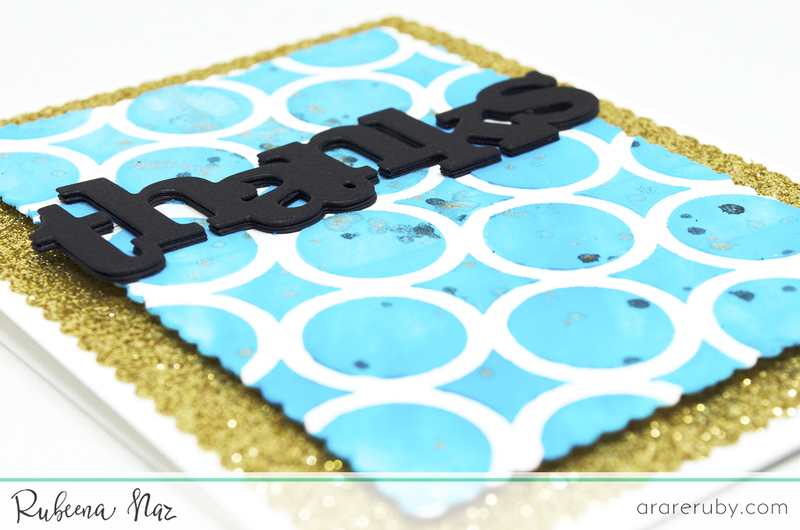 I mounted the word 'thanks' over the embossing paste using glossy accents. For the next set of cards, I wanted to share how I used the In a Word Cutaways. I also love the word dies that Winnie & Walter carries. They are super fun to use! If you've seen my work, you know that I have a habit of creating sets of cards. I die-cut watercolor card stock three times using the larger scallop frame from Essentials: Audrey Cutaways. I added my color first - a minty green, dark pink, and bright yellow. Next, I knew I had to add black and gold. For the first card, I stamped the stars from Wishing You with Evelin T Designs (which was a free set for limited time during the Winnie & Walter 2nd birthday bash release) with VersaMark ink and heat embossed with gold embossing powder. I die-cut the word 'happy' from In a Word: Happy Cutaway from the embossed sheet and also black card stock multiple times. I stacked them all together using glue and matted it down over the watercolor frame. I stamped 'bright, brilliant birthday' from Wishing You with Evelin T Designs using waterproof black ink. I finished it off by matting down the frame over a white card base. This is a really easy way to create cards quickly. For the next card, I decided to use double-sided adhesive sheets. I cut out a part of the adhesive sheet, enough so that I could die-cut the word 'hugs' from In a Word: Hugs Cutaway. I removed one side of the adhesive and attached white card stock over the sticky side. Since adhesive sheets are flimsy, it's harder to use dies with them so adding card stock to one side makes it sturdier. I die-cut the word and then used glossy accents to glue the card stock side over the watercolor frame. I carefully removed the top layer to reveal the adhesive and added black glitter on the bottom side. I cleaned up the excess and then added gold glitter on the top side. I smoothed it out to remove strays. Then I added the sentiments 'sending you' from LS Exclusives: So Tweet with Evelin T Designs and 'wherever you go' from Kindness with Evelin T Designs. I matted down the scallop frame over my white card base. For my last card, I did something similar but only used gold glitter on the die-cut word from In a Word: Love Cutaway. The sentiments are from Wishing You with Evelin T Designs. So there you have a few projects showing you how you can design your projects with a color theme in mind. Thank you SO much for stopping by! I hope you were inspired by today's projects! Love the color combination. With all these touch of glitter. Fabolous and elegent. All of your cards are absolutely beautiful!! Your cards are all super nice. Awesome!!! Fantastic cards and so glad Ruby is this month's leading lady! Her card creations are always magnificent! Ruby, Ruby, they're all GORGEOUS!!! You've been a busy crafty girl, lol. I love them all. Thanks for sharing. I'm scrolling back up to really check out all the details. Yay Rubee! Congratulations! And your cards...... They are Wow-mazing! Gorgeous cards! I can't believe you've only been doing this for 2 years! So very cool! Love these projects. What a great showcase of B/W with a splash as a color combo! Congrats Rubeena ! Amazing cards, I love them ! Very beautiful cards. Loved the bold sentiment. Always love seeing your pretty work, Ruby! Lovely cards. So happy to see Rubeena as this month's Leading Lady, love her style!! All of these cards are so bold and eye-catching, in true Rubeena style! Beautiful cards Ruby, good to see you as Leading Lady. Very nice indeed! thanks to Ruby for sharing. Oh Ruby your first appearance is Oscar-worthy!!! Love you style, girl! Yay Ruby, these are magnificient!! I like how you used gold on all of these wonderful cards. All of these cards are just awesome...neat design, great colors and very stunning. Oh my, these are awesome! Congratulations on being the leading lady this month!! Awesome work!! Beautiful designs!! Love your color combinations and touches of gold on so many!! Very beautiful cards and ideas!! You are so inspiring and fun to learn from!! Such pretty cards! Thanks for the chance to win! 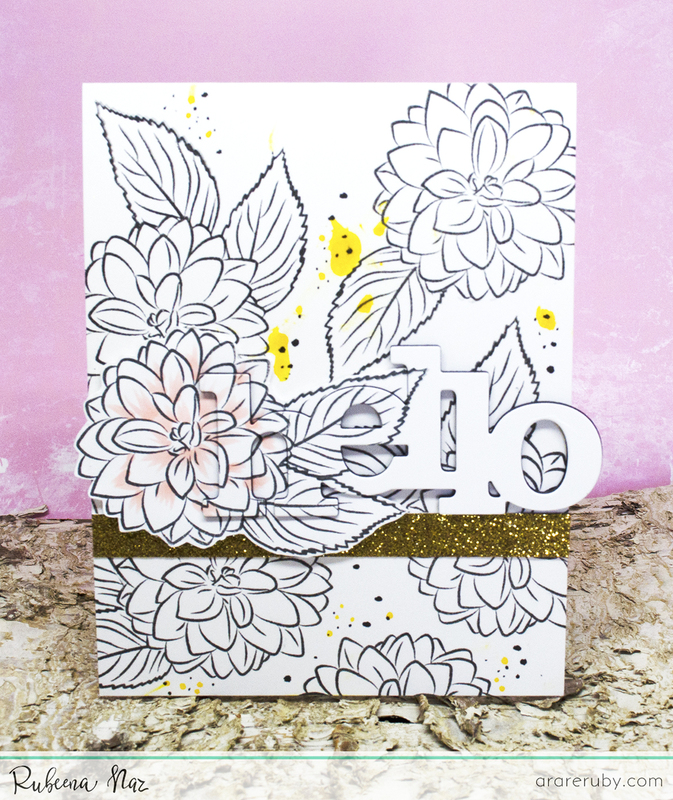 love Ruby's work and all the glittery goodness of these cards! Oh wow! I love Ruby's creations!!! Very creative cards. Love the semi-hidden message on the first one and also the Happy Brilliant Birthday card. Well done! CONGRATULATIONS on being Leading Lady Rubeena!!! I'm already a fan of your work, LOVE your STYLE and I LOVE the cards you have shared today, such CREATIVE designs!!! I'm INSPIRED, especially seeing your use of the In-A-Word Cutaways, sparkle and colour!!! Shine on, Rubeena! Your cards are always amazing! Besides, I really admire your capacity of making "dozens" of (gorgeous) cards for one event or challenge. Hi Rubeena. Your card is gorgeous. I follow W&W by Facebook. Congrats on being a leading lady. I adore that big hello die! Love all the shine with the glitter!